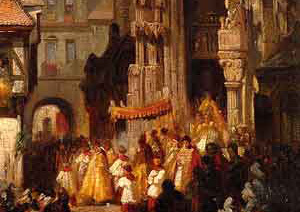 Corpus Christi is a feast that is celebrated on the second Thursday after Whit Sunday. It is a Catholic holiday that the Holy Communion or Eucharist takes places on. It is celebrated by a big feast with the family. Mystery plays have become a popular attendance during this holiday as well. It started in the second half of the 13th century in Europe when nun called Juliana of Liège said that she had been hearing God telling her to make a feast day for the Eucharist. Eventually she got the holiday granted, but it didn't take until after her death.